The 16 Passenger Mercedes-Benz GL is the newest addition in the Expo Limousine fleet. The pictures above are of the actual vehicle as it was delivered. 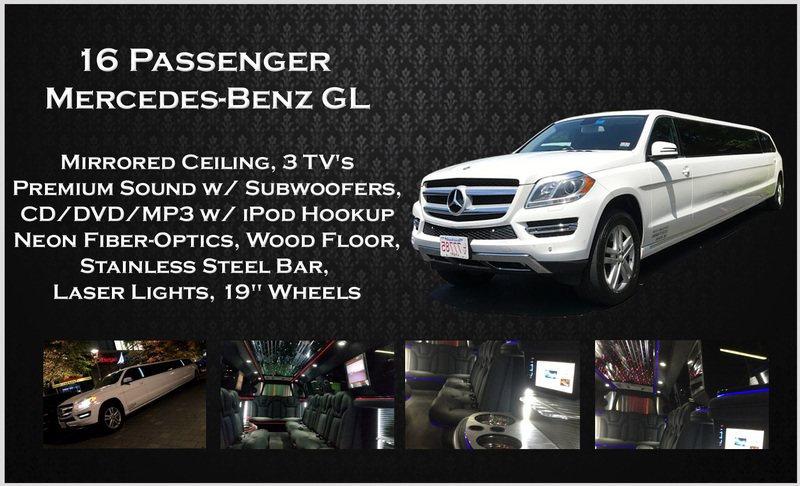 The 16 Passenger Mercedes-Benz GL features Wood floors, Starlit Mirrored ceiling, Neon fiber optic lighting, AM/FM Stereo with CD/DVD Combo, USB and auxiliary jack, as well as 3 LCD TV's and stainless steel and lexan bars. Please call for availability of the Mercedes Limousine for your event and to obtain reservation specific pricing.